The row over tributes laid in memory of a burglar stabbed to death in an altercation during a botched raid on a pensioner’s home has continued as crowds of relatives marked the dead man’s birthday. Around 20 women from the travelling community arrived at South Park Crescent in Hither Green to lay flowers close to the spot where Henry Vincent, 37, fell after being fatally injured in the home of 78-year-old Richard Osborn-Brooks. Mr Osborn-Brooks was arrested on suspicion of murder following the death of Vincent on April 4 but was later told he would face no further action. 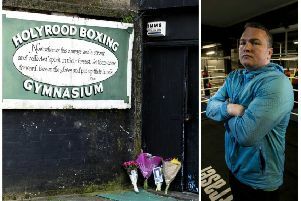 Since the incident, Vincent’s friends and family have sparked outrage among locals in the usually quiet south London neighbourhood by laying flowers and cards opposite the still boarded-up home of Mr Osborn-Brooks and his wife Maureen. On Saturday afternoon, a group of around 20 women who said they were relatives of Vincent, arrived in the street with flowers, cards, balloons and a banner to celebrate his birthday. The group refused to respond to reports that Vincent would be honoured with a £100,000 funeral, or that the cortege would pass by Mr Osborn-Brooks’ home.